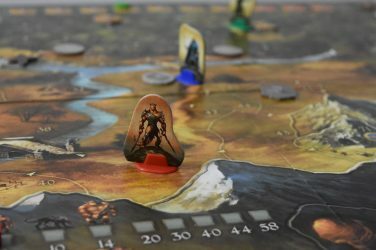 Two years ago, Eagle Gryphon Games relaunched one of the great (and first) worker placement games with Empires: Age of Discovery. Without the Age of Empires license but with a boat load of bling in the Kickstarter, it was a beautiful project, and is one of my favorite games, displayed prominently on top of my game shelf. 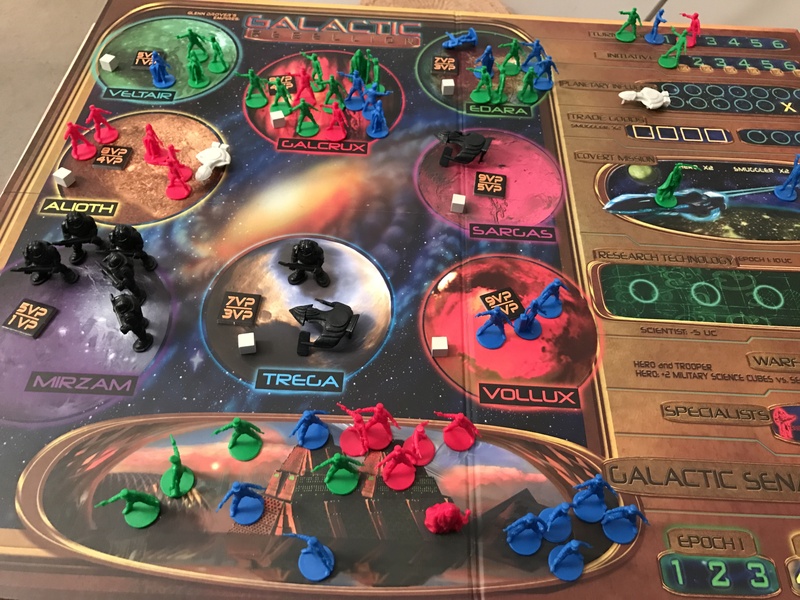 Fast forward a bit and they announced Empires: Galactic Rebellion – a reimagining of the mechanics that made Age of Discovery a modern classic in the confines of a space opera. 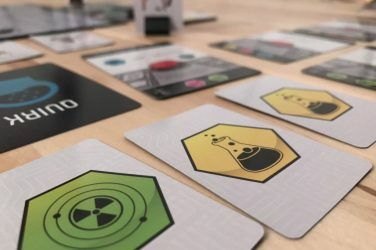 Designed by Glenn Drover and borrowing heavily from many of the mechanics we all know and love from that earlier game, I was immensely excited to see what could be done with this new edition, and now that it’s here and I’ve had a chance to play it through several times, I’m in a tough spot. It’s a good game, yes, but there are some issues that might keep you from buying. Let’s take a look. 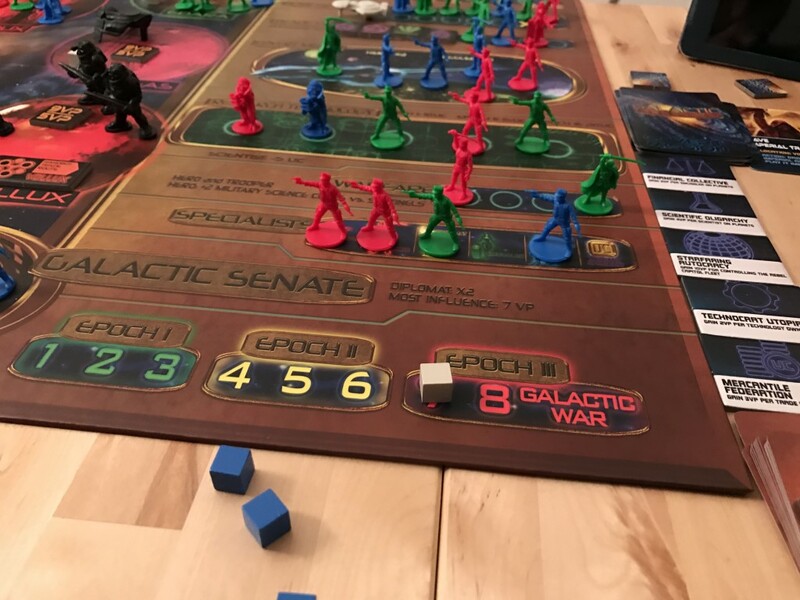 How Does Empires: Galactic Rebellion Play? The game is fairly straightforward, much like its forbearer. Each player will take turns placing five Rebels in one of several action spaces. 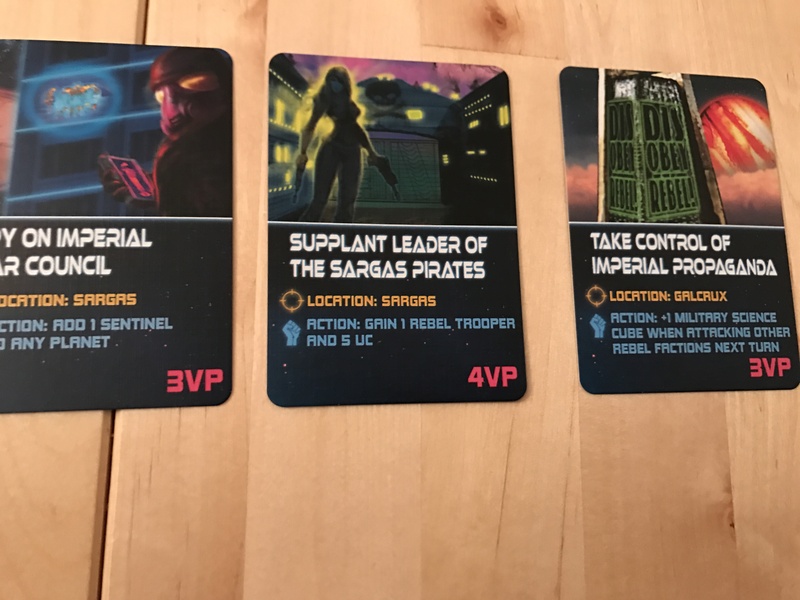 As the game progresses, you’ll be able to recruit other worker types, including Troopers for combat, Heroes for combat and Covert Missions, Smugglers for trade goods, Scientists for technologies, and Diplomats. Each round has five phases. 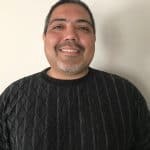 To start you will place all of your workers, in player order, they you will resolve the event boxes in which you placed the workers, then you’ll get income, followed by technology benefits, and a board refresh. Initiative – You can collect income and improve turn order by going here. Planetary Influence – This is how you send workers (of any type) to the planets to populate and take control. Trade Goods – There are a limited number of trade goods available each round – you can collect them from here, with bonuses to Smugglers. Covert Mission – Covert missions allow you to choose one of several cards that are face up at all times to complete. You must have enough units in this space to complete the card, each of which is worth several victory points and a bonus of some kind. Technology – You can buy from the face up tech tree each round, with costs increasing as the game progresses. Warfare – You can send troops to the surface to initiate combat, either with other players or with the Imperial Sentinels on those planets. Galactic Senate – The senate is a separate area control space. When someone takes control they’ll be able to play an Imperial Action Card that can hurt other players, move Imperial ships, or otherwise reassess the board. Each of these spaces has a unique benefit to the players. Trade goods when collected in sets represent your income. Technology benefits can offer huge advantages in the form of extra income, discounts, or free units each round. 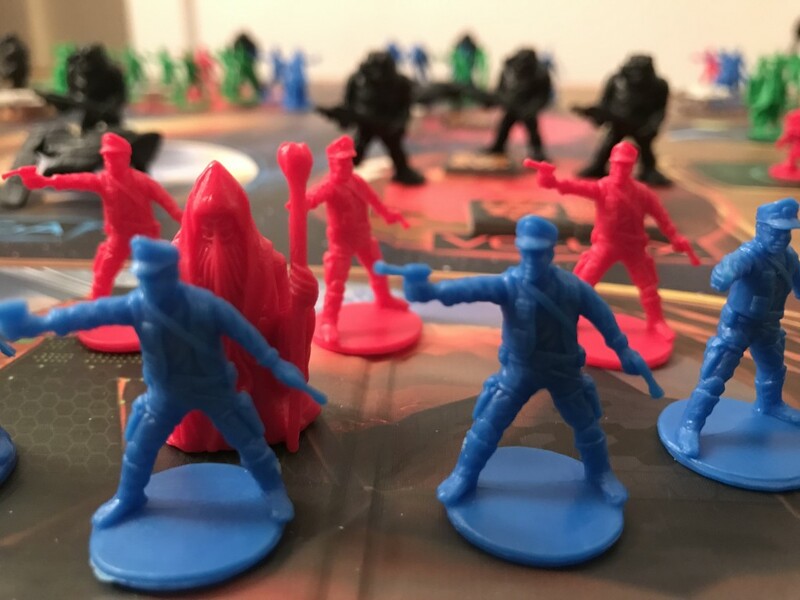 Covert missions offer both one time bonuses and victory points, and everything else allows you to assert dominance on the board. And the board is incredibly important of course. There are several planets, the number of which are available will change depending on number of players. There are three scoring breaks between the eight rounds, and you’ll get points based on your majorities on each of the planets. But at the end of the game, you’ll have to fight the Sentinels on those planets, and they are hard. Combat is probably the most unique component of this game, and most divisive. When you fight someone, you will place a number of cubes into a bag for each combatant. You only start with three of your own, but can get more through Technologies, science cube upgrades, and other bonuses. The sentinels have fight cubes by default, and at the end of the game, there will be a special Galactic War during which you must defeat ALL of the Sentinels (or fight until the planet is devoid of Rebels). In the Galactic War, the Sentinels get eight cubes. It’s a much more combative, tactically driven game than Age of Discovery, which rarely had much in the way of fighting because the points from area control were only one small part of the overall experience. There has been ample criticism about the combat system in this game. Some have complained about how long it takes and others are just not fans of the way it simulates randomness, when dice are equally effective (and faster). Honestly, I’ve had no such issues. Most combats are over in a matter of seconds, and there really are not that many combats in the game. The points you gain from general area control, economy, covert missions and technologies can more than balance the impact of spending resources to fight your fellow players. 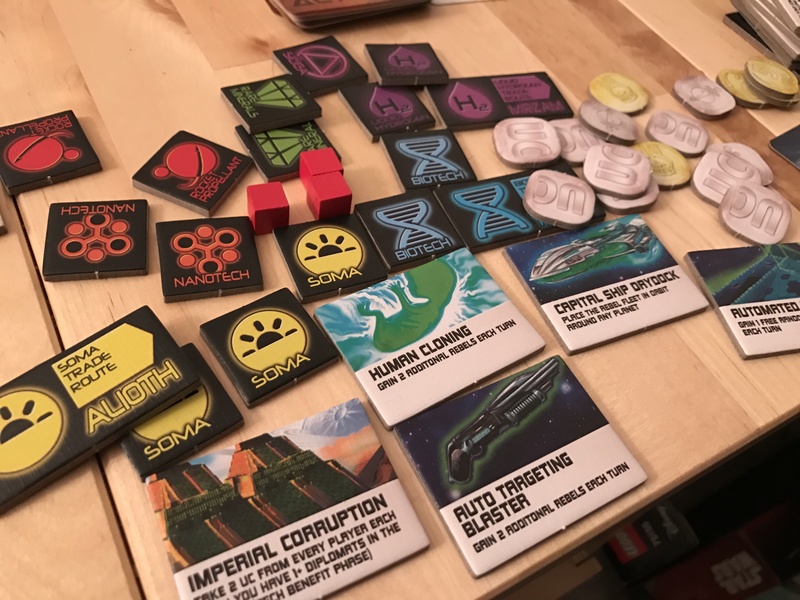 The real focus in my games thus far has been on getting rid of Sentinels and then surgically attacking other players only when it makes sense – much like Age of Discovery. And when you get rid of Sentinels throughout the game, there aren’t that many left at the end to drag out that Galactic War. Is the Galactic War long if you leave the Sentinels alone? Yes, quite. But it hasn’t happened yet, and strategically it makes no sense to ignore them. In contrast, I rather enjoy this new way of managing the board. Having a third party that impacts all players in place in an area control aspect of the game is brilliant in my opinion. It forces you to weigh the relative benefits of getting rid of Sentinels for yourself over others. If you clear a planet and then someone drops an Imperial Ship on it, what do you do? So you have to balance your actions so as not to make it too beneficial to yourself. Don’t give your opponents a reason to come after you. At the same time, it’s possible to largely ignore the board and focus more heavily on generating income, building out trade routes, and buying technologies, which can be HUGELY beneficial. In one game, I was able to take three trade routes off the map plus another twelve trade goods and generate double digit income by the fourth round. 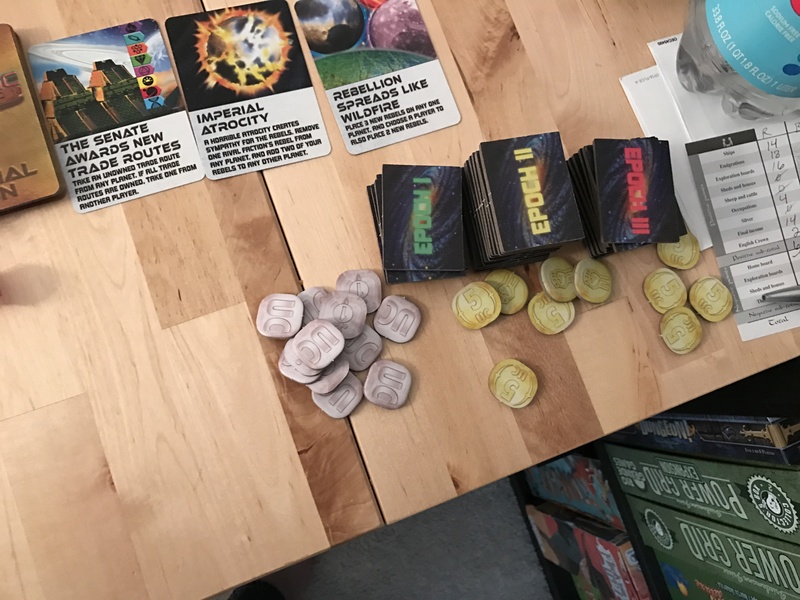 I then bought twice the technologies of anyone else, giving me a ton of extra workers which I then poured onto the board at the end of the game to take over those control nodes. It was a lot of fun, and more importantly, it could have been countered easily by any other player if they chose to go the same route. There are no run away mechanisms here – it’s all about the synergy of your decisions, not the “best” decisions you might be able to make. Okay, so I mentioned in the introduction that were issues. Let’s dive into those. In terms of gameplay, I find Galactic Rebellion to be a solid game. It’s fun, unique enough from Discovery to be its own beast, and while there is some concern over imbalance in the technologies, I haven’t played quite enough yet to get a sense if that plays out over the long term (free workers are incredibly powerful, as are discounted techs). Combined with the first player advantage (which was present in Discovery as well), you have what is a solid, but at least partially dated worker placement mechanism. I still find it incredibly fun, but there are some tighter implementations of similar style games out there after so many years. 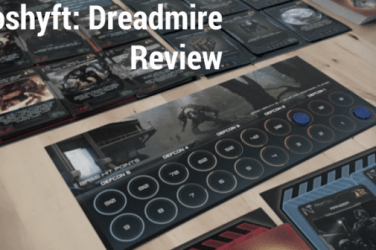 Where this game really lets me down and where I have a heck of a hard time recommending it is in both the graphic design and the components. Let’s look at the artwork first. I am not an artwork guy. I leave that for Chris mostly, and generally don’t worry if a game isn’t the prettiest thing on the planet. I don’t care if Food Chain Magnate looks like it was printed at a Fedex. It’s a darn good game and the look fits. But Galactic Rebellion is all kinds of garish. I get what they were going for – a classic cheesy 50’s sci-fi look with big chunky, embossed letters and shiny images of trippy space vistas, but this is some extremely low grade artwork that wouldn’t have flown twenty years ago, let alone now. 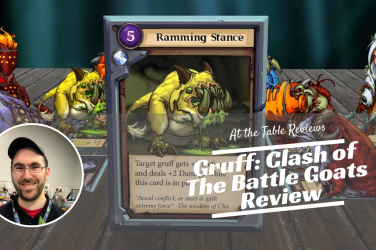 From inconsistent imagery to shoddy layout and design on the board and cards, plus the muddled looks of the miniatures which are plentiful but plastic army-man quality, the game just doesn’t look very good. I’ll leave it at that – you can see what I mean from the photos in this review. Art is subjective though. You might look at all this and think it’s retro awesomeness. What I can’t forgive, though, is the components and cost. Age of Discovery cost roughly the same on Kickstarter. Age of Discovery’s Deluxe Edition with all stretch goals was $90 at early bird and $110 at full and it came with player boards, metal coins, a double sided board, an expansion, and a cloth bag. The exact same price-level for Galactic Rebellion – $95 on Kickstarter and $150 MSRP came with none of these things. No player boards. 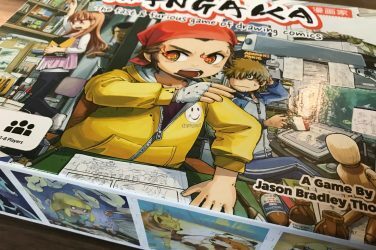 No bag (for a game that requires a bag for one of its mechanics! ), no metal coins, and no packed-in expansion. To be fair, there was a $125 pledge level (MSRP $195) that came with many of these things, but it’s just too much. For $150, you’re getting a game that is missing two fairly important components (cube bag and player boards), as well as the shiny bling you actually got in the Age of Discovery KS at the same price. I like the gameplay of Empires: Galactic Rebellion. I feel it’s a fun unique take on a classic formula, an epic experience in a space opera setting that works well with the mechanism we all know and love. But I cannot recommend it. It’s overpriced, underproduced, and missing key components from a “retail edition” that costs $150 MSRP. 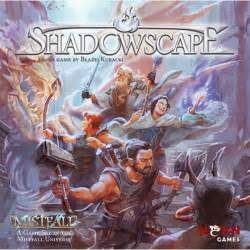 If you happen to stumble upon it at your local game store being played, by all means give it a go, but don’t track this one down unless you can get a real deal (and you like the design choices). 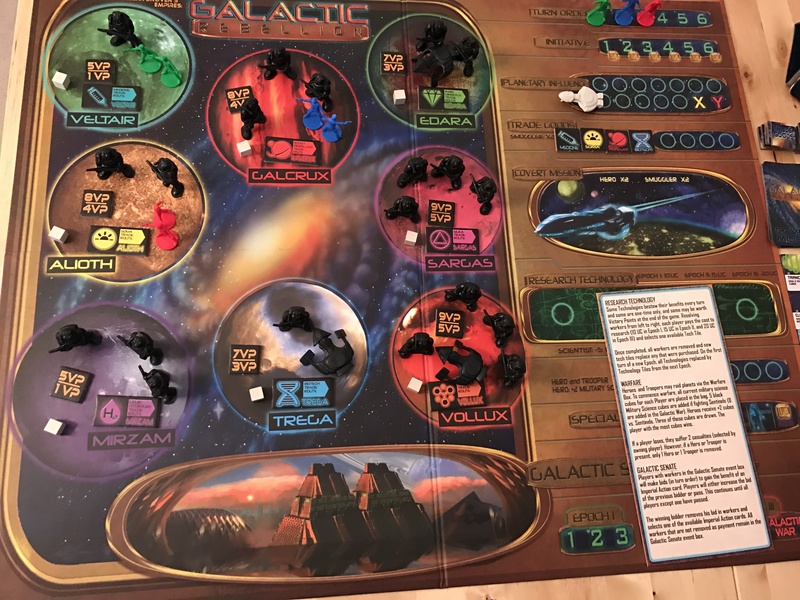 Empires: Galactic Rebellion is a good reimplementation of a classic Glenn Drover design but is overshadowed by poor art work, low quality components, and an obscene price tag that doesn't net everything needed for a standard play through.